Open Arms Cornerstone Outreach Projects are the primary tool of our strategy to reach children at risk with the life transforming message of hope in Jesus right in their community. It is from these projects that all of our other programs grow and are sustained. The heart of these projects begins with mobilizing and training local Christian churches; forming partnerships with civic groups, schools, and businesses; and facilitating use of physical resources in at-risk communities. This work is carried out by Open Arms missionaries that we call our Agents of Hope. 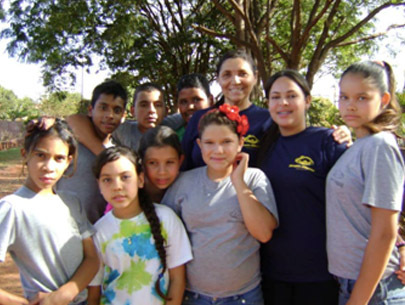 Open Arms Cornerstone Outreach Projects engage children between the ages of 6 and 13 by providing healthy social and recreational opportunities, biblically-based moral and civic education, and guidance for growing in grace and wisdom within their cultural context. Using a combination of large- and small-group teaching methods, the “Open Arms Quest” curriculum introduces children to the time-tested principles of the Bible and the person of Jesus Christ. Participants learn lessons on personal and interpersonal conduct, civic and moral responsibility, and the importance of family through theoretical and practical lessons, games, and community service projects. Open Arms reaches more than 1,000 children on a weekly basis with a team of more than 120 volunteers. Outreach Projects in 4 cities, as well as several small villages, provide activities including art, dance, reading, recreation/games, English classes, Quest/Bible study, and moral education. Hundreds of volunteer leaders have participated in the Open Arms Center for Leadership Training, with 32 hours of intensive course work intended to prepare for the planting of new Outreach Projects. Per child – An investment of $20 per month supplies 1/50 of the total cost of the Project plant and ongoing costs for one year. That’s 70 cents per day! Per Project – For $1,000 a month you can fund a single Project for a year. Per Region – Funding the opening of a new region with up to ten After-School Outreach Projects requires a minimum monthly gift of $10,000.